Home Posts tagged "sepia saturday"
Another Sepia Saturday! 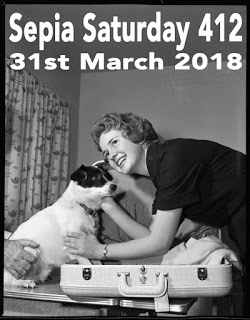 This week’s theme image shows a woman and a dog, and hey, I have LOTS of photos of a boy and his dog! 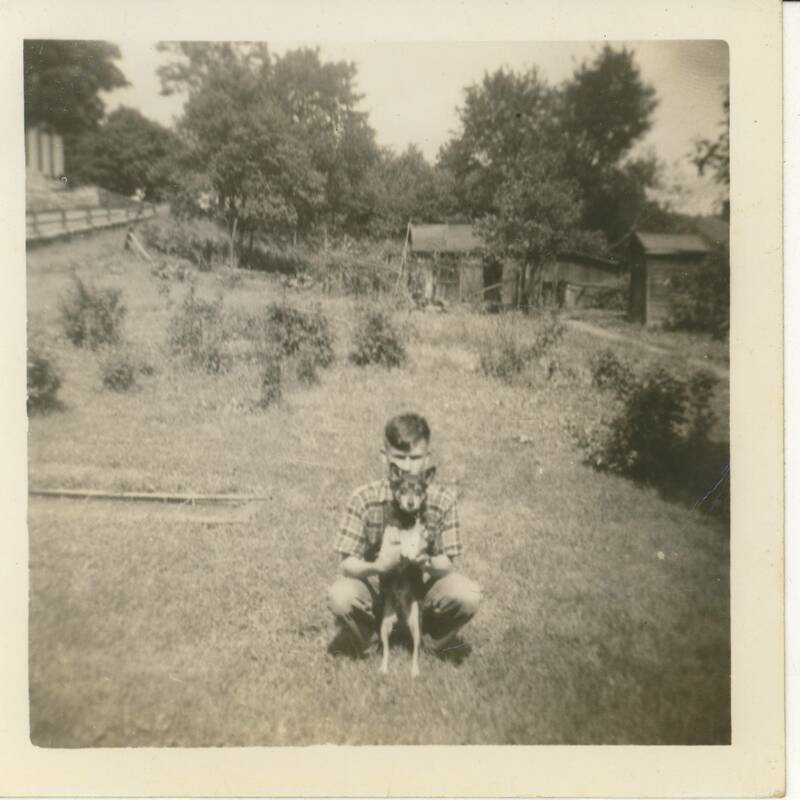 The boy in question is my grandfather, Leon Kitko, and the dog here is actually named on the back of the photo as, “Tippy.” There’s even a year, 1946, so Leon was 13 here. 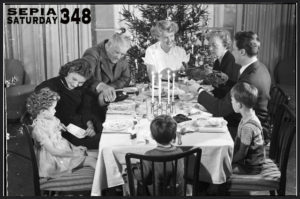 The photo was taken at the family home in Blain City, Pennsylvania, and it’s a familiar background that shows up in lots of photos Leon had a number of pets over the years, and it’s sort of neat to see them all chronicled in SO many years of photos. I know I include my pets in lots of photos, and somehow it’s nice to see that this photo of a beloved pet has been around for almost 72 years!! Short and sweet this week, but it’s a good match to the theme, so I had to go for it. 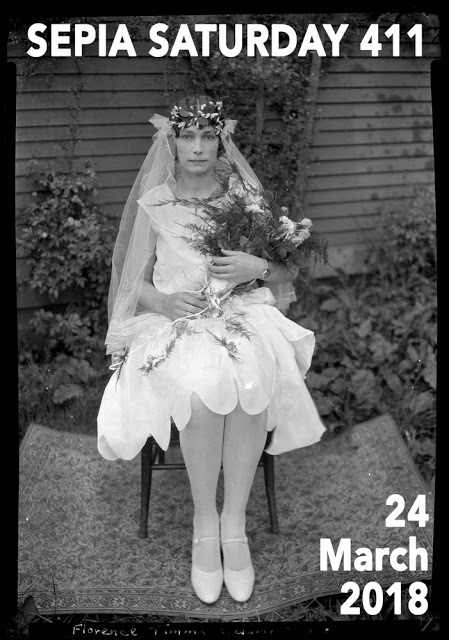 Our Sepia Saturday theme image this week featured a woman on her wedding day in 1928 in Canada. 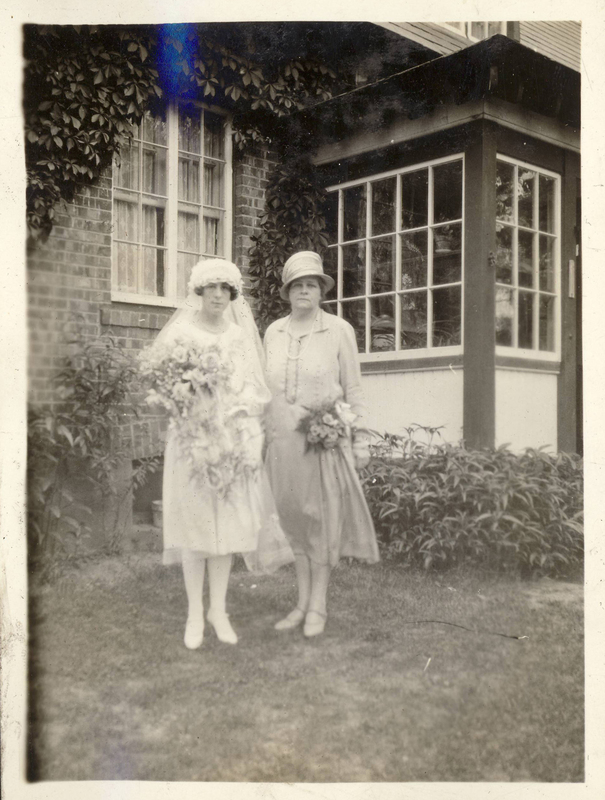 Well, fortunately, I have photos of a wedding in 1927 in Canada that line up pretty well! Above, we have Bessie Melita Creber on the left and her mother, Mary Jane (Battin) Creber on the right. Melita (or “Meta” for short, as it appears on the back of other photos) was born 1 August 1899 in Plymouth, Devon, England, daughter of Mary Jane Battin and John Samuel Creber. Her family, along with two siblings, left England for a new home in Canada in 1911. Meta is just a year younger than my great grandmother, and both their mothers were sisters who must’ve kept in touch over the years. On 18 Jun 1927, Meta married Alfred Norman Harris in Montreal, Canada at the Trinity Memorial Church. I’m not quite sure where these photos were taken, but it’s probably Alfred’s mother’s home in Montreal. The couple appears to later have lived in Peterborough, Ontario, Canada where both Meta and her husband passed away in 1985 and 1969 respectively. This also lines up with a previous Sepia Saturday posting (#233) where I posted a larger group shot of the wedding party. It’s pretty great to find a match to the theme image so close in time and place, so I knew this had to be the one for this week! I kind of lost steam on these and miss nearly a year’s worth of Sepia Saturdays. Things have been pretty upside down here, but I’d like to get back at these since I still have SO many photos from the family collections to share. 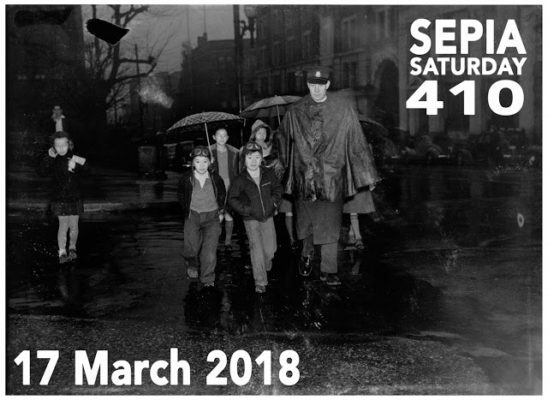 This week’s theme image showed a police officer escorting a group of children. I don’t have a police officer, but I do have a woman escorting two children. The woman is Hilje (Dijkema) Jaarsma and this was likely taken in Uithiuzen, Netherlands in about 1945 or 1946. She only has two children with her, so the youngest child, my husband’s father, is probably out of the photo (likely in the arms of the person taking the photo). 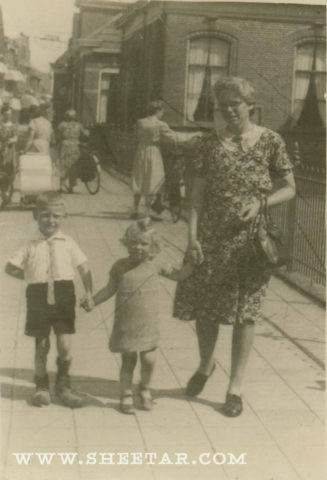 I haven’t been able to figure out the exact street where this was taken, but I’m pretty sure it was somewhere in Uithuizen since that’s where the kids were born and where Hilje and her husband lived before coming to the USA. Anyway, a short and sweet one for this week to get back into the habit! Our final (official) Sepia Saturday is this week and a new theme picks up again for 7 January 2017. I thought, instead of a holiday dinner party that I might share this photo of folks I think are celebrating New Year’s – there are silly paper hats, and in a few photos, kisses being planted on some of the men! 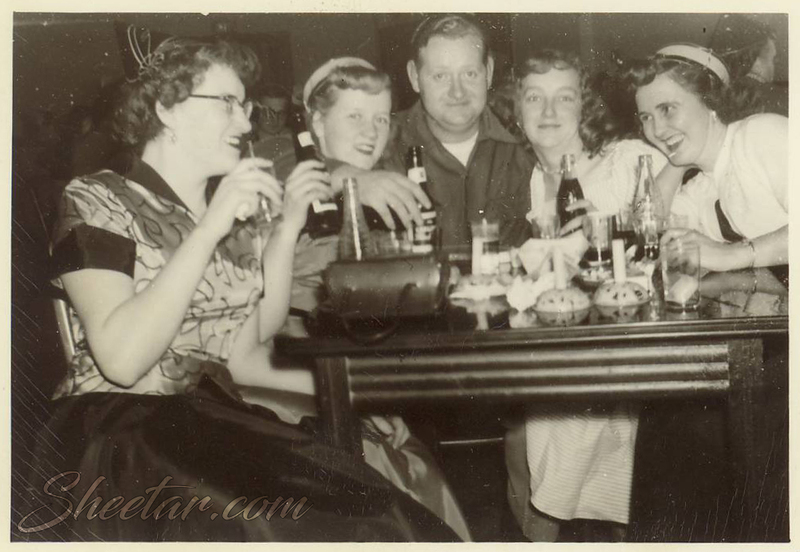 They all look to be having a good time, even if I can’t recognize anyone in the photos at all. I assume this is late 1940s or early 1950s based on the fact that they’re from my maternal grandmother and the photos in this set all appear to be taken right around that time. I’m not quite sure who took the photos either – it could’ve been my grandmother or possibly her cousin, but again, it’s hard to tell since whoever held the camera didn’t show up in any of the photos! They’re still a great set of pictures and I love the big smiles and joyful atmosphere.